Floods Turn Northern California Towns Into Islands: 'Our World Is Getting Smaller' The Russian River's flood stage in Guerneville is 32 feet. But it reached nearly 46 feet Wednesday night. The National Weather Service predicted that major flood conditions will continue Thursday. 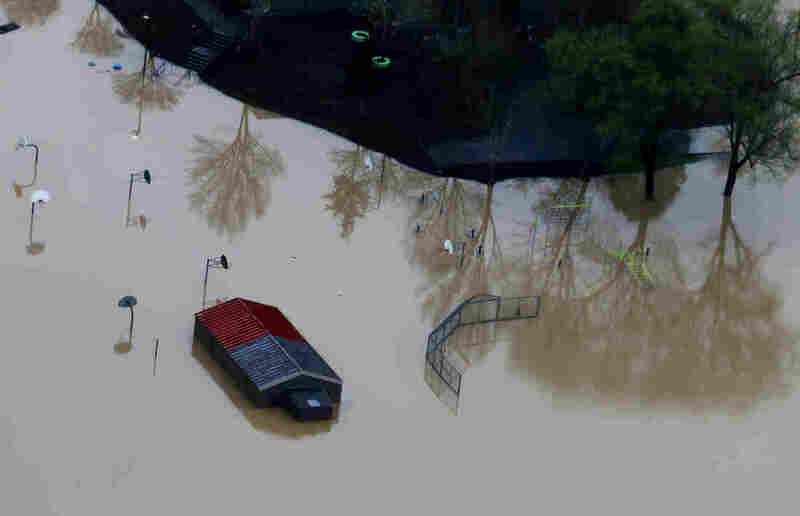 A playground sits underwater in a flooded neighborhood in Guerneville, Calif.
As of Thursday morning, waters were finally beginning to come down, and there had been no calls for emergency rescues in Guerneville overnight, the sheriff's office said. Rescue workers evacuate residents on a truck as they drive through a flooded neighborhood in Forestville, Calif. The Sonoma County Sheriff's Office issued a mandatory evacuation order Tuesday afternoon, when the river was first predicted to surpass its flood stage. By Wednesday morning, the department said, "You cannot get into or out of town. All roads leading to the community are flooded." The river crested at 45.38 feet, the National Weather Service said, announcing preliminary results Thursday morning. The water flooded thousands of buildings in Sonoma County, member station KQED's Molly Peterson reports. 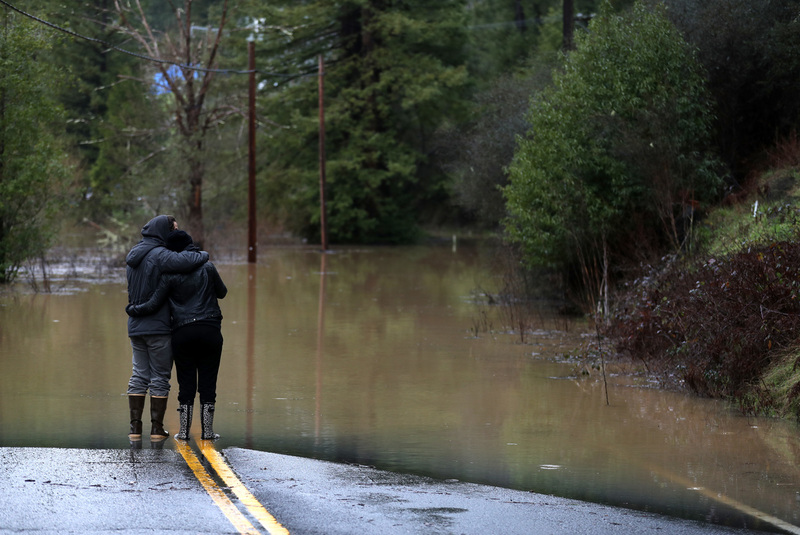 Ari Herman (left) and Lea Herman embrace as they look at a flooded section of State Route 116 in Guerneville. "I'm gonna deliver two packs of smokes to my friend who's on an island right now — in his house," Cooper said. "And I've got canoes. We're gonna canoe down River Boulevard." A neighborhood sits in floodwaters near Guerneville. Residents used anything they could find to get out and about and to reach people who were stranded. As roadways became streams and rivers, cars were replaced by paddleboards, canoes, rowboats — and, in at least one case, an oar-driven dumpster. 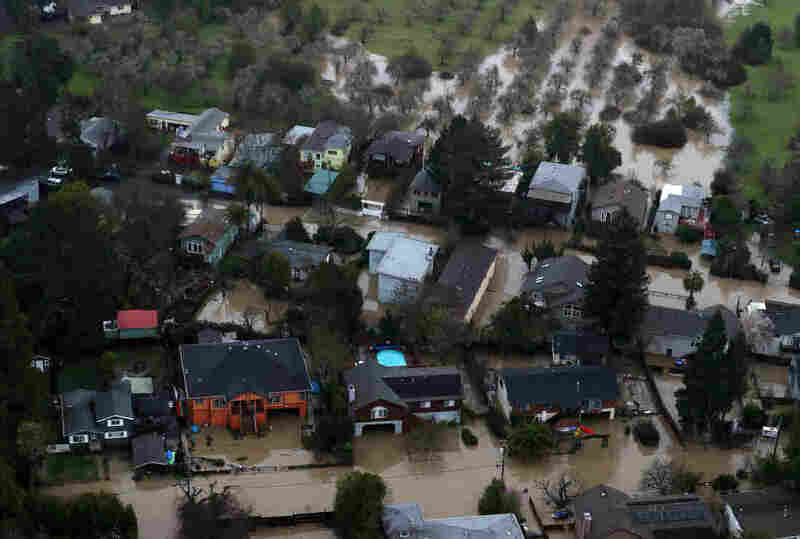 The water reached near-historic high levels, falling a few feet short of earlier devastating floods that have hit Guerneville, which is located some 75 miles northwest of San Francisco. The Russian River's level was measured at 48.56 feet during a catastrophic flood in February 1986. As recently as 2006, torrential rain from winter storms also brought dangerously high water. The current floods are by far the worst in the past five years; 2017's flood stage topped out at 37.82 feet. Rich Willson paddles through the miniature golf course in Guerneville. The National Weather Service categorizes any floods above 45 feet as "disastrous" for Guerneville, predicting that nearly all its downtown will flood at that height. At 44 feet, water is high enough to flood the Safeway grocery store and main business areas in Monte Rio and Guerneville Park. "Our world is getting smaller," Baxman said. A flooded vineyard near Guerneville. The Russian River has crested over flood stage and is expected to continue to rise to record levels and inundate Guerneville. Guerneville's downtown is lined with shops and restaurants; dozens of wineries are a short drive away. 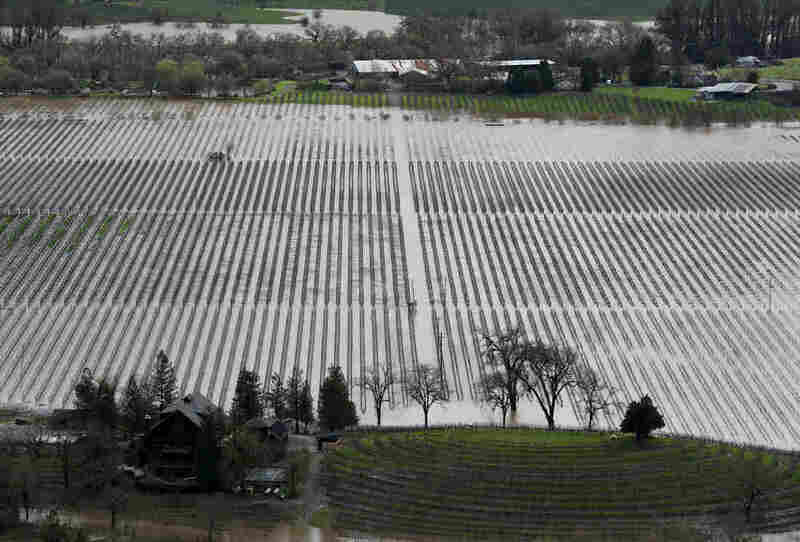 But some of those vineyards are now underwater thanks to storms that brought intense rainfall to the area. Flood warnings prompted officials to urge some 4,000 people to seek higher ground in Guerneville and Monte Rio; similar calls went out in the nearby community of Yolo, where Cache Creek's waters flowed over a levee Wednesday. Yolo County officials lifted an evacuation order late Wednesday night. State Route 116 cuts through a flooded neighborhood in Guerneville. Long sections of State Route 116 were closed, either covered by floodwaters or cut off by mudslides. 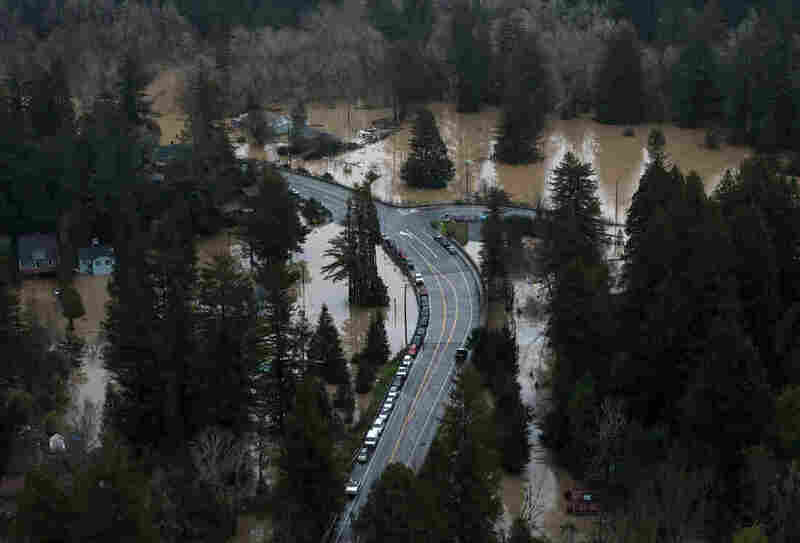 While Guerneville seemed to have the worst rain and flooding, other towns also faced damaging water and evacuations, as the Russian, Napa, Sacramento and other rivers topped their flood stages. 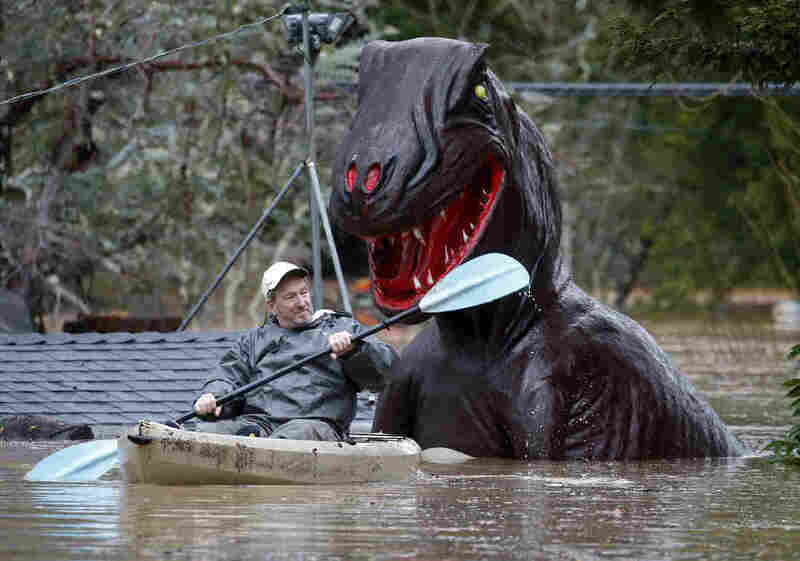 "Rivers and creeks continued to rise in Napa Wednesday," KQED reports. "Napa River had risen to about 18 feet by noon Wednesday, according to a bridge marking." As the storm brought rain and snow to Northern California, an avalanche in the Sierra Nevada forced two Amtrak trains to stop in their tracks and reverse direction, The Associated Press reports. The state highway patrol used a helicopter to take a woman out of the small city's downtown on Wednesday in what was called a medical emergency. 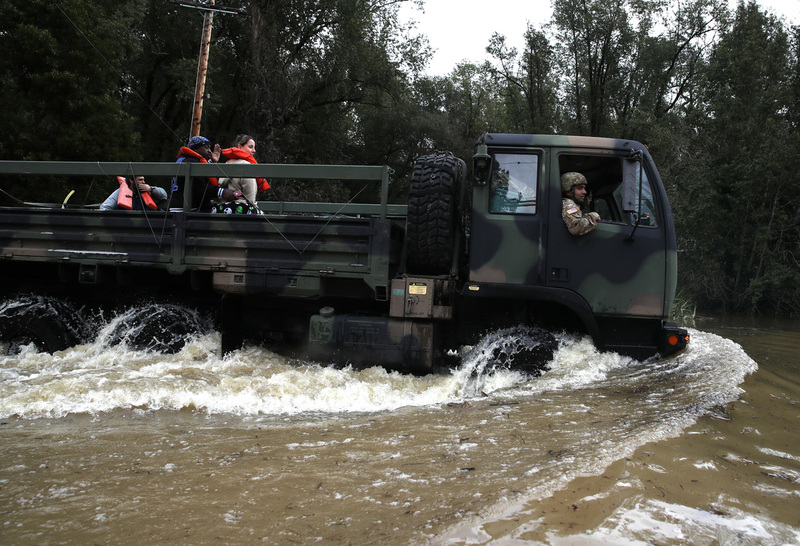 The National Guard also sent rescue teams to Guerneville and Monte Rio in the form of six high-water vehicles. 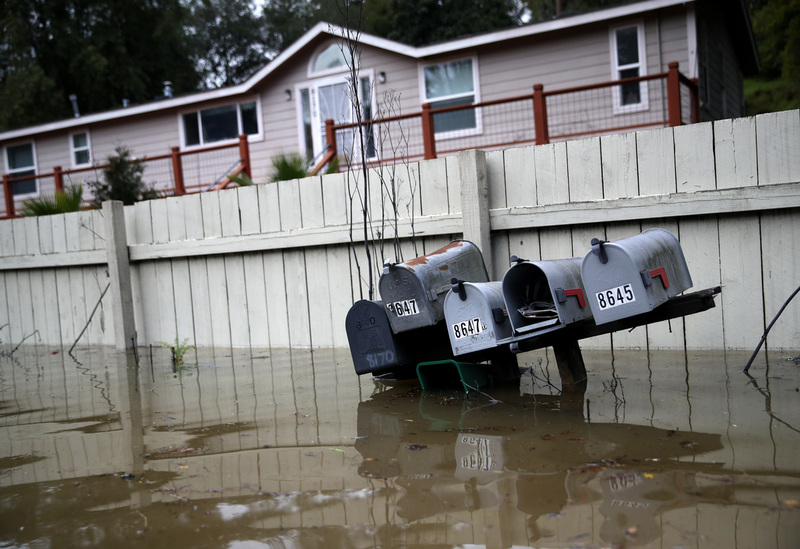 Mailboxes sit underwater in a flooded neighborhood in Forestville, Calif. There's no rain in Thursday's forecast for Guerneville, but there's a chance of heavy rainfall Friday night, the National Weather Service said. There's also a chance for more showers through next Wednesday. Residents of Guerneville and other affected communities must now wait for the water to go away so that they can clean up the mud and take stock of the damage.